I have a very exciting post to share with you all, I've been using and loving the very stylish Queensdale Tote* by Pink Lining. The design and print is fab! This is the Black Cabs print but there's also the Navy Bows print which is just as striking, but for me the Black Cabs is very British which I love. This is great bag for any bag lover, It has a few key features which I will go through, I wanted to take a nice lot of photos to show you how good this bag is! (1) Two front pockets with magnetic poppers, these fit those little things which you want to have on hand or in easy reach. Keys, Mobile mirror or any makeup fits perfectly! (2) Adjusting straps, you can change these around very easily by unclipping them and slotting through the big eyelets. 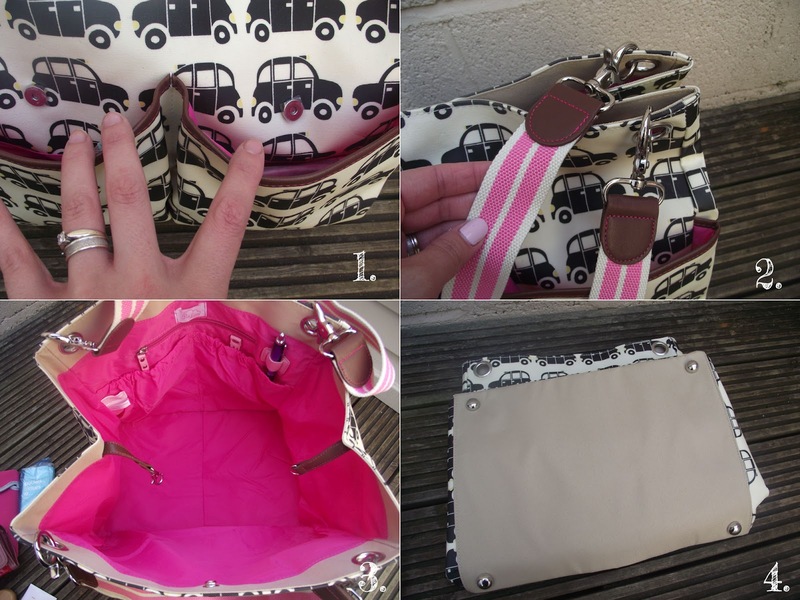 (3) Very roomy inside, this would make the perfect gym bag, beach bag or general day to day bag. The hot pink lining works really well with the tote. (4) On the bottom it has 4 metal studs, giving added support and protection to the base of the tote. Check out these Black Cabs! Very retro! (5) There's a little clip inside which draws in the bag, I like to keep this clipped because it makes the bag feel more secure. (6) There is a larger popper which fastens right at the top of the tote. If you have lots to fill the bag with you can unclip for extra space. 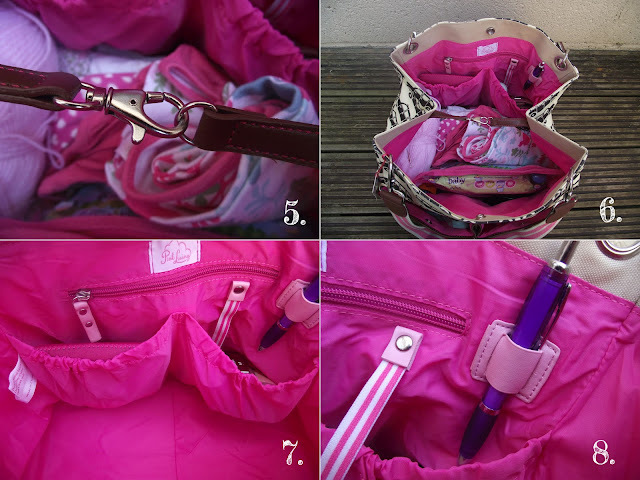 (7) Two roomy pockets inside and a personal zip pocket. These pockets are perfect for storing your purse, reading book, Kindle or diary. (8) Key fob and Pen holder, no more searching around the bottom of your bag for your keys or a pen! I'm a busy mummy and have just stopped using a changing bag but still use one for my work some days, so I always have one but love how spacious this one is. This is a great all round bag for any lady, whether you're a busy mummy or a busy career lady, this would fit your kitchen sink in! They also have matching laptop cases which look very cool! The outer lining is wipe clean and easy to look after making it perfect when caught in the rain. What will be your Autumn/Winter Bag?